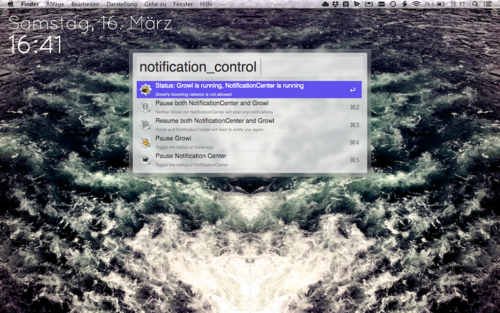 An Alfred v2 workflow to control Growl.app and Mountain Lion’s Notification Center. You’ll need version +1.3 of Growl. Just download this extension, install it and it’s ready to use. 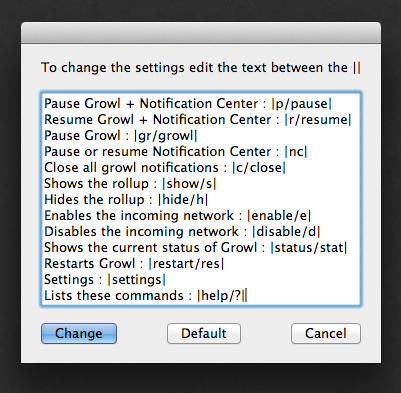 If you don’t have Growl installed, you can just download the NotificationCenter only version of the workflow. This extension is written in AppleScript and uses the Shell. If you experience any troubles with this, hit me on twitter. If you don’t have the Alfred Powerpack or you don’t want to use Alfred for this task, you can either extract the code from the workflow file or just ask me for the source. This extension is also available for Alfred 2. Lists these commands : help/? This extension is written in AppleScript.